These wines come exclusively from the finest vineyards in the "Hugel" estates, and are made in only the very best vintages. Harvested at perfect maturity, in the oldest vineyards of the estate, the wines are powerful, although still dry, and require an extensive period of ageing in bottle in order to reach their full potential. 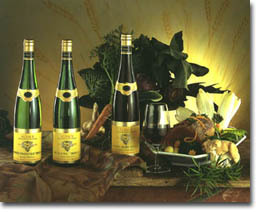 They are the perfect Alsace wines to accompany the finest gastronomy. Produced from strictly selected grapes from our own vineyards in the best vintages, it has a captivating bouquet of spices and exotic fruit. Best enjoyed on its own, after five to eight years, its quality will remain intact from one generation to the next. Made in exceptional vintages only, following severe selection during all the stages of its productions, this very fine wine possesses remarkable finesse and elegance. At its best after three to five years, it often develops distinctive "mineral" hints which further underline its exceptional complexity. It reveals its true character when served with a noble fish dish, or shellfish, in a cream or butter sauce. This noble wine can be classed among the finest dry white wines of France. Discreet and withdrawn in its early youth, it benefits more than any other wine from slow maturation in bottle. After at least five to eight years, it reveals its true potential, with an opulence and richness that are quite astonishing. The perfect choice with foie gras, white meats and, surprisingly, with game. When nature permits and the harvest is perfectly ripe and sound, the grapes are removed from the stalks and fermented on the skins for two to three weeks. The resulting deep red wine is then run off into small oak casks for maturation. After from two to five years in bottle, the wine achieves such a ripe intensity of fruit, that it becomes an ideal partner for meat or cheese.